Supernovas are the explosive deaths of the Universe's most massive stars. In death, these objects blast powerful waves into the cosmos, destroying much of the dust surrounding them. This composite from NASA's Spitzer Space Telescope and Chandra X-ray Observatory shows the remnant of such an explosion, known as N132D, and the environment it is expanding into. In this image, infrared light at 4.5 microns is mapped to blue, 8.0 microns to green, and 24 microns to red. Meanwhile, broadband X-ray light is mapped purple. The remnant itself is seen as a wispy pink shell of gas at the center of this image. 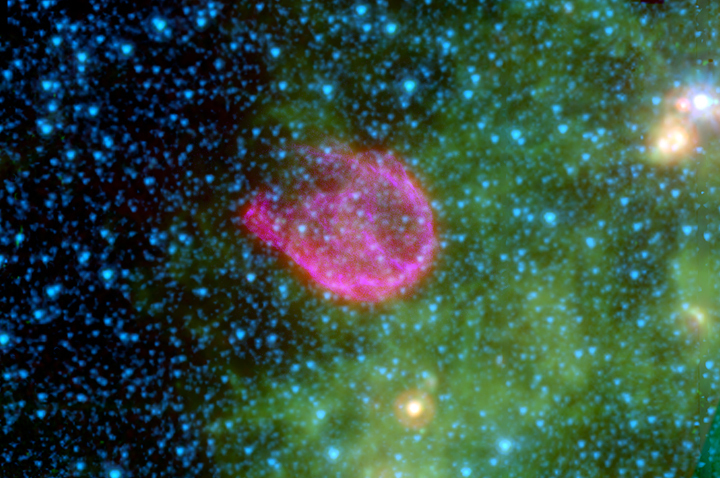 The pinkish color reveals an interaction between the explosion's high-energy shockwaves (originally purple) and surrounding dust grains. Outside of the central remnant, small organic molecules called Polycyclic Aromatic Hydrocarbons, or PAHs, are shown as tints of green. Meanwhile, the blue dots represent stars within that lie along the line of sight between the observatories and N132D.